MARYLAND 51, #14 N.C. STATE 50. The Wolfpack have been nothing if not inconsistent and were coming off a big upset of then #1 Duke. The Terps have been so bad of late former player Terrell Stoglin had been Tweeting how lame they were. So...you had to see this coming. Oh...and Maryland had new unis. 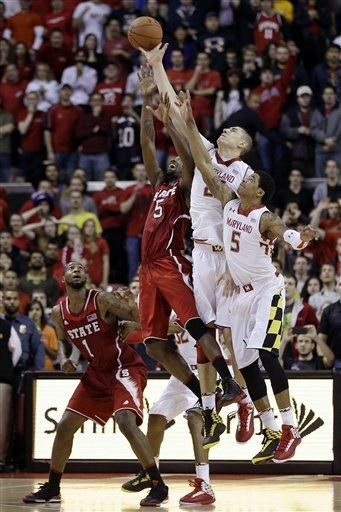 Alex Len dropped in a missed shot by Pe'Shon Howard with 00.9 seconds left, giving Maryland a stunning victory over No. 14 North Carolina State on Wednesday night in College Park. Howard drove the left side and came up short on a 5-footer, but the 7-foot-1 Len grabbed the ball in front of the rim and eased it through the hoop. After the Wolfpack failed on a desperation heave on the other end, thousands of students in the sellout crowd stormed the court (none in a wheel chair) after the final buzzer to celebrate Maryland's first win over a ranked team since March 3, 2010, against No. 4 Duke. Len, with 10 points, was the only Terrapin to score in double figures. Maryland led for much of the game but needed Len's basket to end N.C. State's 10-game winning streak. MIAMI 60, BOSTON COLLEGE 59 - Durand Scott hit four free throws in the closing 30 seconds and drew an offensive foul to help Miami extend its best conference start ever by beating pesky Boston College on Wednesday night. Scott finished with 15 points, Kenny Kadji had 14 and Trey McKinney Jones 11 for the Hurricanes (13-3, 4-0 ACC). It's Miami's best conference start since it went 5-0 to open its Big East season 5-0 in 1997-98. Olivier Hanlan, who led Boston College (9-8, 1-3) with 17 points, was fouled shooting a 3-pointer with a half-second left. The first two free throws rolled in but Hanlan front-rimmed the last one. The ball was tipped in the lane and the horn sounded.